Gourd decorating comes in as many forms as there are ways to use these celebrated calabashes. I'm referring to the hardshell (sometimes spelled "hardshelled" or "hard-shell") type, known botanically as Lagenaria, not the smaller, better-known, and more colorful ornamental type. This project involves making a hat from a so-called "bird-house" gourd and decorating it for a contest at the Ohio Gourd Show; the photo here shows what the completed work looks like. Even those unfamiliar with gourd decorating are probably familiar with another use to which such gourds are often put: making bird houses (as suggested by their very name). But you're truly only limited by your imagination. I've seen decorated gourds serving as everything from lamps to clocks. Bottle gourds were used to carry water and food going back into prehistoric times. One thing you'll learn quickly if you decide to take up gourd decorating as a hobby is that you'll have to decide how much time you have to spend on a project and adjust your design accordingly. You can spend an enormous amount of time at gourd decorating. I should know, as someone who was once a gourd fanatic and advanced beyond painting and staining them. The mere beginner decorates a gourd by painting or staining; when you graduate beyond this first step, you gravitate toward more novel (and time-consuming!) gourd decorating projects. Advanced crafters burn images onto gourds using a wood-burning tool and even carve elaborate designs into them using a Dremel tool. But I'm giving you (and myself!) a break in this gourd decorating project, which can be completed relatively quickly. This, despite the fact that it involves going beyond merely using paint to create a design. What we'll be making -- on an elementary level -- is known as a "gourd sculpture," which consists of cutting material out of one or more gourds (one, in this case) and gluing the pieces together so as to create a sculpture. When your hard-shell gourd is through drying, it will be covered with black spots. This is fungus. But do not worry: the fungus has formed on what is considered the outer skin of the gourd. This outer skin is just a superficial layer and will be removed in the cleaning process. Fungus doesn't hurt the part of the hard-shell gourd that "counts," presuming proper drying has taken place. The fungus can stain the gourd surface below the outer skin, but if you are planning on painting your gourd, the paint will cover up these stains. To clean a hard-shell gourd, fill a pail with a mixture of 1 part bleach to 10 parts water. Submerge the gourd in the pail. This is difficult to do because gourds are buoyant; I accomplished the task by weighting my hard-shell gourd down with a heavy object. There's no set soaking time required: the longer the soak, the more the outer skin will loosen up. I soaked mine overnight. The next morning, using a copper scrubbing pad, I scrubbed off the outer skin. The bleach in the water helps counteract any fungus stains that have penetrated beneath the outer skin. Face mask: this is a safety concern, as inhaling gourd dust is considered harmful! When your craft project calls for exposing the inside of the gourd, you will have to clean the insides after cutting it open. In our case, since we're making a gourd hat, we have to cut out an oblong section of the gourd to accommodate a head. This cut will give us access to the inside. The inside walls of a dried gourd are caked with dried pulp and seeds. Because of the angle, it is very difficult to remove all of it. At some point, you'll have to decide how completely you need to remove it. For the gourd hat in this project, we can simply line the inside of the hat afterward to ensure that no flakes from the dried pulp and seeds get into our hair. After making my cut (more on that later), I began the process of cleaning the inside of the gourd by, once again, soaking (the bleach here is optional). I let it soak for about an hour. Then I removed the bulk of the dried pulp and seeds by scraping the inside walls of the gourd with a tablespoon. It's rather like spooning out the pulp and seeds from a butternut squash -- only more difficult! With the excess removed, I scrubbed the walls with a copper scrubbing pad. For my purposes, this was enough. But artists who are making fancy gourd bowls have to take greater pains to clean the insides of their gourds. Many craft their own homemade tools just for this purpose: highly specialized tools that help them deal with the difficult angle for cleaning. In making this cut, I used a template. It was not a fancy template. To trace it out, I simply found whatever I could think of in my house that had an oblong shape (I ended up using the bottom of an ornamental teapot, which I expanded freehand by drawing concentric circles around it). The basic idea was to make an oblong incision in the gourd. At this point, I wasn't trying to make a hole big enough for my head (I'd enlarge the hole later); but I did want the oblong piece of gourd that I was removing to be large enough to carve into a raccoon head to complete my sculpture at the end (more on that later). I used a Dremel tool (with cutting attachment) to cut out the hole in my gourd hat, after tracing an oblong shape onto my gourd (see prior page) to serve as a guideline for my cut. If you don't have a Dremel tool, make your cut with an Exacto knife. Set aside the oblong piece of gourd you just removed; this will be the crowning glory of your gourd hat and will come into play later. For now, we'll concentrate on enlarging the hole in the gourd so as to adequately accommodate your head. To enlarge the hole, I drew another oblong shape (freehand) onto the gourd, all around the hole. Rather than trying to get the size exact all at once, my plan was to remove a little gourd material (again, with the Dremel tool's cutting attachment), then a little more, and a little more...until I got it just right. Better to be safe than sorry, right? When my hole was approximately the correct size, it was time to even it out by achieving a more perfect oblong and softening the edges of the cut. For this step, there's no really good substitute for the Dremel tool, which has sanding and grinding attachments that are perfect for this kind of operation (substitute sand paper if you have to, but it won't be the same). Let me issue a warning here, though, to those new to using a Dremel tool in gourd craft: a little pressure goes a long way! Don't let all this talk of cutting and sanding lull you into the idea that working with a gourd is just like working with wood. It is not! The substance of a gourd is much softer. And once you've ground off gourd material with the sanding attachment, remember, it's gone forever! So if you're trying to even the two sides of your hole, don't spend too much time on one side all at once: you might remove too much, without realizing it. Instead, alternate between sides. When you're satisfied with the hole you've made in your gourd hat to accommodate your head, spray the inside of the gourd with polyurethane spray (this will keep flaking to a minimum). Now we'll work with that oblong piece of gourd we removed earlier. The idea here is to trace the outline of a raccoon's head onto this piece of gourd, shaving off the excess afterward. Then we'll trace the raccoon's features on in pencil to serve as guidelines for a paint job. Later, we'll be gluing this head back onto the gourd; it will give some pizazz to our coonskin-cap gourd. Does all that sound a notch above your artistic prowess? Don't worry. The goal here is not to create a realistic likeness of a raccoon. Rather, our goal is more modest: to create the suggestion of a coonskin cap. Our gourd hat is going to be intentionally cartoonish, which will also save us time. To have something to go by while you're working, pull up a website with raccoon pictures and browse the results for ideas. Remember the template we used on Page 3 (the piece of paper cut into an oblong shape)? It's time to put it to use again. We're going to give our cartoon raccoon an oblong face, but we have to carve out some ears that will stick up above the rest of the head. So we'll be shrinking the oblong shape except for the top part; leaving excess on the top part will give us room for carving the ears. Go ahead and trim down the oblong-shaped template. Place this template onto the oblong piece of gourd we removed earlier. In terms of left-right positioning, center it (measure with a tape measure and make guiding marks in pencil for yourself); but in terms of up-down positioning, place it not in the center but closer to the bottom. Trace out your smaller oblong shape. Now create a separate ear template. To do so, simply draw a somewhat rounded triangle on a piece of paper and cut it out -- a triangle of about the size you think would be appropriate for a raccoon ear, given the size of the oblong (head) template. Using the ear template, trace the ears onto the oblong piece of gourd. Again use a tape measure to keep yourself oriented, making marks in pencil. Since I wanted to supply the top of the head with a slight peak, I drew in a line freehand to form a slight crown. Now stand back and see if you like how the composition is coming along. If you don't, start making adjustments: that's what pencil erasers are for! Once you're satisfied with the shape of the raccoon's head, make your cuts to remove excess gourd material using the Dremel tool with its cutting attachment. Most artists use acrylics to paint hard-shell gourds. Acrylics are widely available in craft stores and come in a large variety of colors. We'll be painting both the head and the tail in this project. Draw guidelines on the hard-shell gourd first, before painting; the paint will hide the lines, and there's no sense in trying to be a hero and painting features on freehand! Painting the raccoon's tail is simple. We're using the "neck" of the hard-shell gourd (i.e, the long, skinny part of a birdhouse gourd) for the tail. For paints, use black and gold, since the rings on a raccoon's tail (at least for a cartoon raccoon, such as ours) alternate between black and gold. I made the rings slightly bigger as my painting took me closer to the raccoon's torso. When I reached the torso, I extended the final ring (it happened to be a gold ring, for me) further into the torso, just so that I wouldn't have to worry about this area later. The torso will eventually be covered in gray felt, which will overlap this last bit of painting. Painting the face of our raccoon gourd will be a bit more challenging. Again, start by drawing features in pencil. Measuring and marking to establish a center point is helpful; then you can work off of this center point to indicate where the main features should go. Note that we will not be painting eyes onto our hard-shell gourd; for a cartoon raccoon, the plastic eyes you can find in craft stores are more effective (the comical ones that bounce around). We'll glue those on at the project's end. In addition, I inserted a roughly diamond-shaped mark on the forehead, in black. I held off on painting the whiskers in till the end, to make sure they wouldn't be in the way when I glued the eyes on. Note also that I preferred to divide the black mask up into two parts, separated by a white strip. For those new to painting hard-shell gourds, it's best to deal with one color at a time; otherwise, your paint brush may slip and you'll end up with smudging. So apply one color where it's needed, then take a break, allowing the paint to dry before applying another color somewhere else on the face. It's easiest to take care of the wide swaths first. Apply a coat of white paint to the bottom 2/3 of the face, outside of the lines you drew for the features. After that dries, apply a coat of gray paint across all the top 1/3, except for the ears. Now fill in the mask, nose, mouth and forehead accent with black paint. The ears are easy enough. I wanted gold to be the primary color. Then I edged the ears in black paint and also painted the centers black. Even for a cartoon raccoon, I didn't feel that I could achieve a realistic enough look for the fur on the torso using paint. So instead, I used a piece of gray felt as an underlayment, upon which I would later glue-gun Spanish moss in two different colors as a fur substitute. Attaching the felt to the hard-shell gourd using a glue gun is a bit trickier than it may at first appear. Remember, in working with a gourd, you're not working with an even surface; so there will be some wrinkling. The felt I used was a 9"x12" rectangle. I cut it up into two rectangles, each 9"x6". I applied the two pieces separately. It's helpful to clip the felt onto the gourd, to hold it in place temporarily. If you don't have larger clips, even paper clips will work. Fortunately, you don't have to secure every square inch of the felt to the gourd with glue (although it helps to be thorough with the perimeter, at least). I found it best to glue down one end, remove the clips, fold the felt back onto itself, then slowly unroll the felt, glue-gunning it down as I went along. Trim off the excess felt (and save it) hanging over the edges of the gourd. I repeated the process with the second piece of felt at which point I had the bulk of the torso covered. I did, however, leave the bottom of the gourd uncovered, to make room for the head, which still needs to be glued on. If you're new to glue guns, be forewarned: the hot glue dries fast! Don't try to cover too big an area all at once, or you'll be left with hardened pieces of glue, to which the felt won't stick properly. I overlapped my two pieces of felt, gluing felt to felt where they met. Don't be fussy about the seam: it will be covered later by the Spanish moss. Likewise, despite the annoyance caused by the felt wrinkling, you really don't have to be too fussy about eliminating wrinkles, as the Spanish moss will hide these, too. Where the wrinkling is simply intolerable, cut into the wrinkle with scissors, and attach each half of the wrinkle to the gourd, separately, using the glue gun. As I mentioned on the prior page, I left a little gourd surface exposed when glue-gunning the felt on my coonskin cap: I did not cover the bottom of the gourd. I wanted to leave this end exposed until I had glue-gunned the raccoon head on. It may have been fine to glue-gun the raccoon head to the felt, but I thought a better join would be achieved by gluing gourd to gourd. Be that as it may, now I glue-gunned the raccoon head to the bottom of the gourd, making sure I used plenty of glue. Remember those felt trimmings? I glue-gunned those to the gourd wherever I deemed some "touching up" to be necessary where torso met head and torso met tail, respectively. 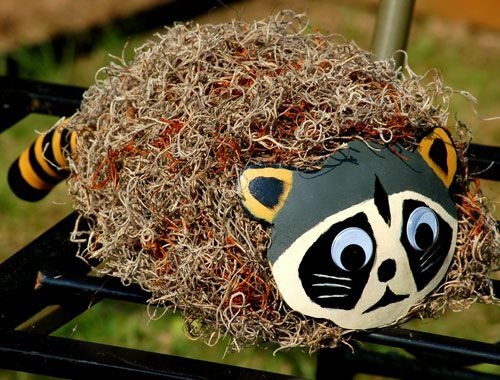 Next, glue-gun Spanish moss to the felt as a fur substitute for your raccoon gourd hat. I purchased Spanish moss in two different colors at the craft store: brown and the natural gray. Since the fur on the back of a real raccoon is not monochrome, I felt that blending the two colors would look better. The gray will be the primary color, the brown more of a "highlight." My technique for achieving this effect was to glue-gun strands of the gray Spanish moss to the gourd first, followed by strands of the brown Spanish moss, topped off, finally, with another layer of gray. First, glue your "fur substitute" around the head, obscuring any seams left over when you glued the excess pieces of felt to this area. Then work your way down the back of the raccoon. This is more art than science. To blend the strands of brown Spanish moss with the gray Spanish moss, "weave" in and out with your fingers. You don't have to glue every square inch of Spanish moss to the felt. In some cases, you'll be gluing one strand of Spanish moss to another. It's messy and inexact, but it works out in the end (trust me!). Trim any of your "fur substitute" that is left hanging too far over the edges of your raccoon gourd hat. Then step back and survey your creation. Could your raccoon profit from a haircut here or there? Scissors in hand, play the barber and snip away to put on the finishing touches. How Long Do Gourds Last? On this final page of the tutorial, we'll finish the coonskin cap and also look at how long gourds last, as well as what other fun projects are out there for those who enjoy Halloween decorating. There's not much left to do now. Just glue on the whimsical, bouncing plastic eyeballs (measuring twice for location, so that you'll have to glue only once) and paint on the whiskers, using white paint. You're done. To review what the completed decorated gourd looks like, return to Page 1. The picture above brings us full circle, showing what the hardshell gourd used in this project looked like before it was harvested, dried, cleaned and decorated. Let the kids wear this novel coonskin cap for Trick or Treat. Or wear it yourself to costume parties, fun craft contests and the like. Just because hardshell gourds are superficially similar to pumpkins, do not think that your gourd will eventually rot away -- and all your hard work with it. No, hardshell gourds are durable. Store your decorated gourd in moderate temperatures and out of direct sunlight, and it should survive indefinitely unless abused. Take On That DIY Landscaping Project With Confidence! Do You Know the Hidden Meaning Behind a Classic Christmas Carol?